The legendary Z3TA+ synthesizer has been used on countless records, and it’s distinctive sound has been a staple of electronic artists the world over. And now Z3TA+ iOS puts the full power of Z3TA+2 on your iPad. Packed with hundreds of presets, modulatable waveshaping, dual mode filters, and flexible effects, Z3TA+ iOS is the perfect creative synth for making music anywhere, anytime. Z3TA+iOS will be there to quench your thirst for sound design when you’re working behind your studio rig, or on the road. It embodies every characteristic of the original synthesizer and brings the all of parameters you know and love to a fluid iOS7 touch-enabled interface. Z3TA+iOS is perfect for both experienced and new users especially when connecting to other audio applications using AudioBus and Inter-App Audio. 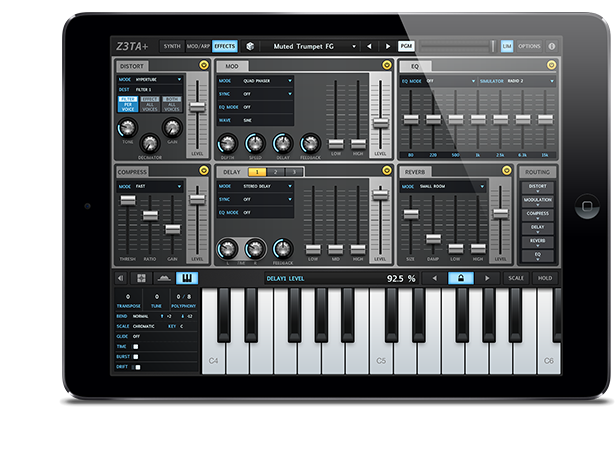 Plugin in any iPad compatible MIDI controller and take your performance to the stage. Click the button below to check out more details and download from the Apple AppStore.